The H.R. LaBounty Safety Award Program was designed for the Joint Powers Insurance Association (JPIA) members as a way to promote safe workplace behavior and operations practices and reward those employees who demonstrate safe behavior, take part in recognizable proactive activities, or participate in risk-reducing actions. It gives JPIA members a way to foster a safety culture that reduces the potential for losses. Several Carmichael Water District (District) Employees are award recipients. Below are the award winning safety contributions by year. 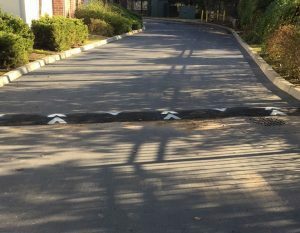 Ryan Stinson: Ryan Stinson identified the need for and equipped a newly installed water diversion curb with reflective paint to increase visibility of a driving or tripping hazard. Shelby Kalisiak: Shelby Kalisiak developed and implemented a model safety training and tracking program that is thorough, efficient and would work well for any agency. Chris Nelson: Chris Nelson created a formalized and centralized Heat Illness Program Notification System for administrative office operations lone workers that is safety efficient and works well for an agency that has a good amount of individual field contributors/functions requiring monitoring and notification. Cody Brown, Matt Stacy, and Gary Mills: Cody Brown, Matt Stacy, and Gary Mills fabricated and installed customized storage systems on crew trucks to maximize safe practices and safe environments for operators; minimize employee risks; and assist with maintaining efficient, accessible, and safe storage of tools, supplies and equipment and safe accessibility for operators. David Biagi: David Biagi increased the visibility of tripping hazards at the Bajamont Water Treatment Plant and marked critical areas around fire extinguishers that need to be free of obstructions so there is proper accessibility. Rob Crichton, Matt Stacy, and Scott Bair: Rob Crichton, Matt Stacy, and Scott Bair implemented warehouse and corporation yard improvements to maximize safe practices and safe environments for District staff; minimize employee risks; and assist with maintaining and tracking of safety equipment and safety for employees. Lynette Moreno: Lynette Moreno implemented a new safety awareness program at the District – Payroll Safety Tips. Every payroll, a safety tip is inserted with the employee’s paycheck to promote awareness. Each safety tip relates to office, field, home or personal safety. Lynette Moreno: identified the need for and created laminated safety cards located on equipment to remind the operator of emergency procedures. 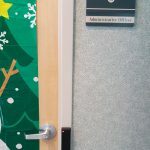 Lori Kalisiak: Lori Kalisiak researched, analyzed, recommended and implemented The Building Access Security Improvement Plan in order to minimize risks, provide and extra level of security, and manage access to the facility and District employees. Cecilia Dodge: Cecilia Dodge instituted hands-free, ergonomic telephone equipment for all front office employees and others. 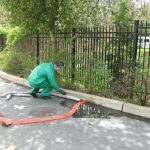 George Richmond: George Richmond conducted a Chemical Spill Emergency Response Drill that focused on proper use of personal protective equipment and the basic elements of spill response. Kevin Johnston: Kevin Johnston researched, planned, and implemented an Emergency Standby Power Program for the District. Lynette Moreno: Lynette Moreno identified the need for and establish check in and emergency communication procedures for contractors working at the District’s corporation yard. George Richmond: George Richmond had the idea to install permanent low cost eye-wash stations at District well sites. 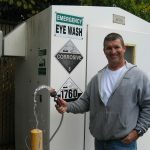 The new eye-wash stations allow for fast access to a flow of water that is under constant pressure. Scott Bair & Chris Nelson: Chris Nelson identified the need to create a kit for night time emergency field work while out supervising a major leak repair. 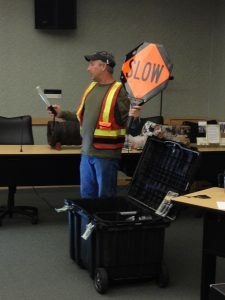 With suggestions from Chris Nelson, Scott Bair created a night time emergency kit for field services crews to incorporate in any District work projects that are during low visibility times. David Flores: David Flores identified the need to create a meter equipment rack that holds the equipment during non-use at the District’s office. During down time the equipment would be placed on a desk or hung over a bookshelf causing a potential tripping hazard. David fabricated an equipment rack from scrap redwood, wheels from a scrap office chair and a tool hanger. Lori Kalisiak: Lori Kalisiak identified the need for and implemented security improvements at the District’s main office and corporation yard. The improvements were implemented to provide an extra level of security, manage access to the facilities, and reduce cost.